When analyzing web sites for SEO purposes I use many different tools to extract the data I need. With the news that Google is no longer intending to update the Page rank shown on its toolbar (not that it was very reliable anyway), I have for a number of years been using one of my favourite tools called Moz Open Site Explorer. One of its metrics which I found very useful is the domain authority and page authority. The problem I have come across is with the page authority data. 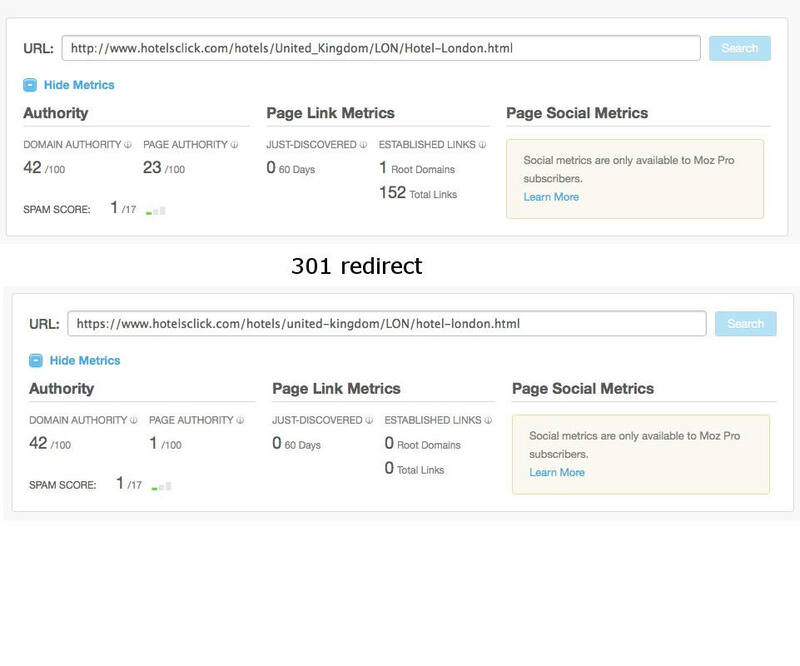 When a 301 (permanent) redirect is added to a particular url which correctly redirects to another url on the same site, then like Google, the Moz algorithm should pass the Page authority (PA) to the new url where the page is redirected to. On the 9th of January 2015 a site wide 301 redirect was added to the hotelsclick.com to pass over to the https protocol. At around the same time (which can be easily be verified on archive.org ) the url re-write format was cleaned up to show lowercase characters. This is where the problem lies. I’ve reached out to Rand Fishkin of Moz oon Twitter but didn’t get a satisfactory reply as to why this is happening. Goes to show that you can’t trust 100% the data you see. This entry was posted in SEO on September 19, 2015 by chris.